This shows a back view of me with my hand on an enormous tree stump with a big machine behind my head. It is quite a large painting owned by the Victoria Art Gallery. When the Artists for Nature Foundation was started, the idea came from the Carmanah Project, where a number of environmental organizations such as the Western Canada Wilderness Committee, brought artists into the Carmanah valley to paint before it was logged. The biggest Sitka Spruce in the world were growing there. This is the first time in the history of the world that a group of artists saved a significant ecosystem of the planet. A Dutch friend of ours, who is a nature artist impresario heard about it and thought it was a good idea. 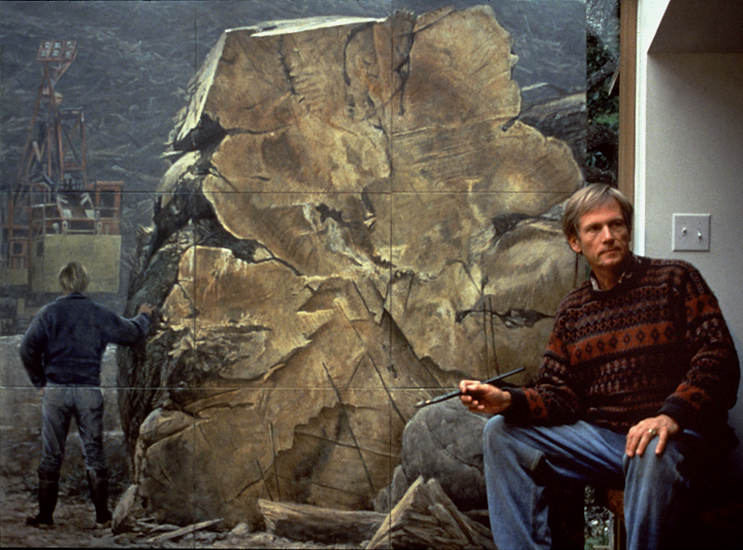 He founded the Artists for Nature Foundation. The first major project was the one in Poland. We headed into the Carmanah valley for the painting session, past all the hideous clear cutting that was going on which was why we were urgently trying to save it. We had to go along the logging road to the end of the area and past this huge Sitka spruce that had been cut down. I show that picture in almost all of my talks as it was an old tree when Christopher Columbus came to America - and what is it now . . . junk mail or 2 X 4s? We dont need junk mail, but we do need 2 X 4s. People might be surprised when an environmentalist is in favour of logging, loggers, and logging communities. I am, but not the way we are doing it now. They have actually gotten rid of jobs in the logging sector because of the big machines. It is not the environmentalists and other noble things that are taking away jobs, but the over capitalization of the logging industry; that is also putting some logging companies in debt to buy these great big machines. My painting is really an attack on the kind of logging that we do.